Editor's note: If you try the playground, we'd love to know what you think. Leave a comment below! 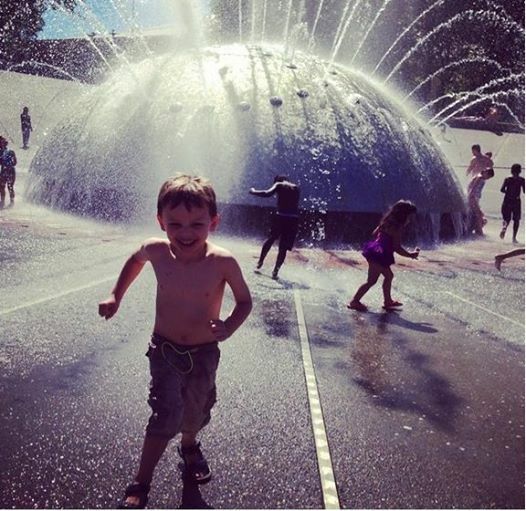 Starting this weekend, the International Fountain will have some serious competition as favorite free kid attraction at the Seattle Center. Artists at Play, the much-anticipated, artist-designed free outdoor playground, opens Friday, May 22, at noon, in Next 50 Plaza, the site of the old Fun Forest near the Experience Music Project. After more than two years of planning and development, the 1.25-acre playground is ready for kids (and adults) of all ages and physical abilities to climb, slide and explore. It is interactive, adventurous and musical, with several ADA-accessible amenities. 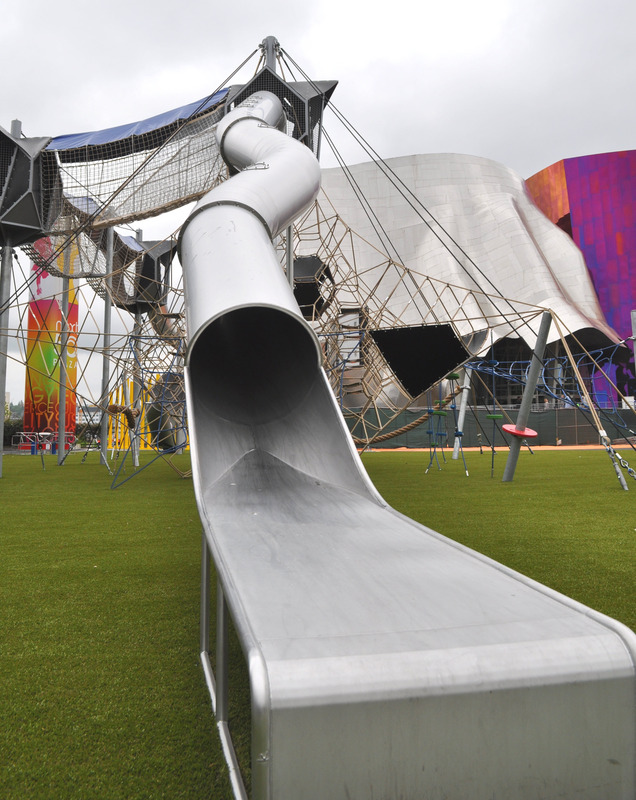 The most eye-catching feature of the playground is a jaw-dropping, 35-foot climbing structure, one of the tallest such structures in North America. Kids can scale the rope ladders that lead straight to the top or take the route up through the large climbing net and then traverse the narrow rope passageways to reach the top of two tall tube slides. The tower is built by KOMPAN and is recommended for kids ages 5 and up, and adults are invited to play, too. 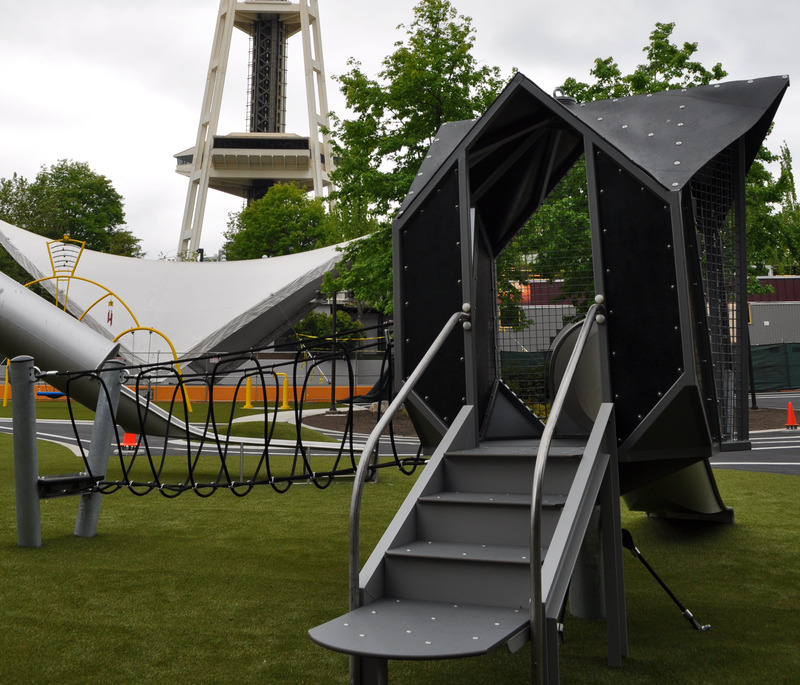 As far as safety, which is already raising some questions, Seattle Center says parents should use their discretion in knowing their own children’s abilities and limitations in allowing them to play on the tower. My take: The structure is enclosed in nets, so I would not have hesitate to let my kids give it a try. But I would steer younger children away from the large structure, because if they get scared after they get to the top it would be tricky to rescue them on the passageways. - An ADA-accessible swing set prompts wind chimes to ring. - Kids can throw pebbles at bronze plates created by Seattle artist Judith Caldwell, causing musical notes to peal. - At an ingenious sound fence, kids can pull on a billiards ball and a string plays a perfectly tuned note. - A letter tree also delivers the seven notes of the scale when one of seven handles is spun. Many other features are interactive and encourage exploration. - A smaller play structure mimics the large one, but at a friendly height for toddlers and preschoolers. - Bright yellow listening stations that resemble giant earphones allow kids to talk to a friend from across the playground. - A labyrinth leads kids down paths to the center, where they'll find a riddle to solve in bronze inlaid circles, also designed by Caldwell. - A fully accessible merry-go-round, one of the only of its kind in the region, allows kids in wheelchairs to join in the fun. The artists and developers who designed the playground — a team that included artists Trimpin and Judith Caldwell, landscape architects Site Workshop and play equipment provider Highwire — interviewed hundreds of kids to hear what they wanted to see — and hear — in the playground. Some of their introspections on what sound means to them are depicted in the white ribbons painted onto the ground throughout the playground. The playground is well-designed with enough to keep kids occupied for a while. There are playgrounds in the region with more activities, but Artists at Play should rank as among the most adventurous play areas in the Northwest (see our list of Seattle-area adventurous playgrounds). The playground area is set on asphalt — no green lawns here — but it has whimsical mounds of artificial turf for running and jumping. Picnic tables and benches are placed around the playground for families to relax and enjoy lunch outside. If you're looking for a greener setting, head for the Broad Street Green, a nice lawn for picnicking just south of the Space Needle. Or, of course, the area surrounding the International Fountain. Artists at Play opening celebration: Artists at Play will open on Friday, May 22, at noon with an opening celebration. Opening events will include music and dance performances and a ribbon-cutting ceremony. Friday is also the opening day of the Northwest Folklife Festival. 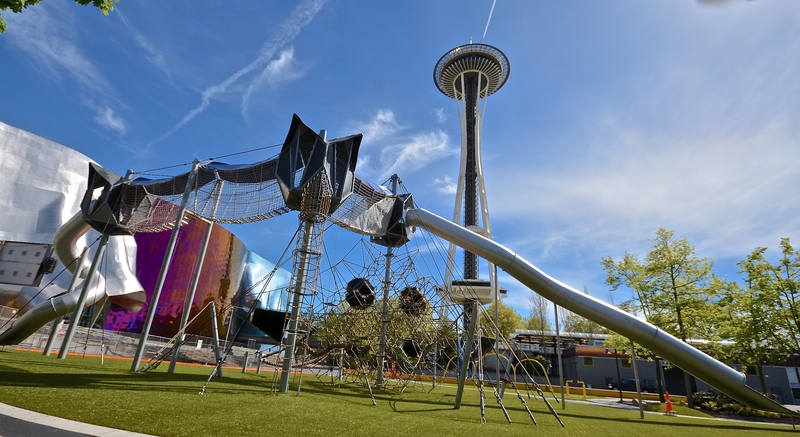 Location: The playground is located at Next 50 Plaza in Seattle Center, which is immediately north of the Monorail station and west of the Experience Music Project. Paid parking is available in several lots and on adjacent streets. Many buses stop close to Seattle Center. Another option is to take the Monorail from Westlake Center. Skate park: Check out the skateboarders doing tricks at the 10,000-square-foot Seattle Center skate park, near the Seattle Children's Theatre. Fountains: Bring a picnic lunch and eat on the large lawn near the celebrated International Fountain, which features a continuous music-and-water show via its 137 nozzles that shoot water up to 120 feet high. Kids can also splash and wade in the recently upgraded DuPen fountain. Foodie fun: Grab an excellent meal at reasonable prices inside the renovated Armory now featuring food from some of the best restaurants in town. The Armory also is host to dozens of free cultural festivals held throughout the year that usually include children's activities and performances. Movies at the Mural: In July and August bring chairs or blankets and enjoy free Movies at the Mural, with gems such as Goonies and Guardians of the Galaxy.